About Zebra Falls at Zebra Falls! 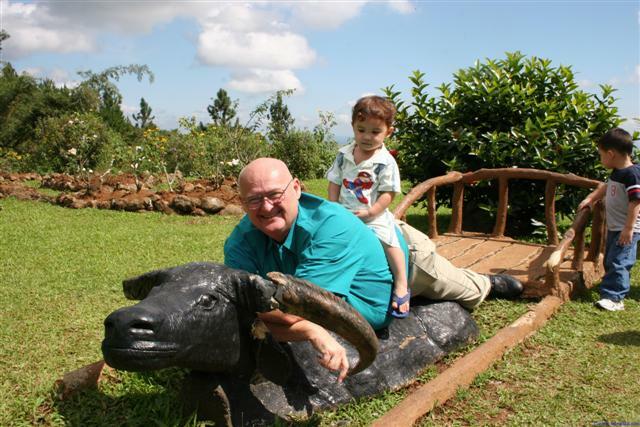 Gene Wilson, Dave Wilson on statue of carabao at Eden Nature Park just outside of Davao City, Mindanao, Philippines. Zebra Falls is a Blog dedicated to the personal use of Gene Wilson. I have been a lost child, farmer, oil field driller, forest fire fighter, soldier, student, bum, scoundrel, counselor, entrepreneur, engineer, wanderer, photographer, internet pioneer, author, publisher, poet, philosopher, oil field producer, beneficiary of good fortune, friend, husband, father, son, brother, grandfather, seeker of wisdom, seeker of truth, delusional, and a fool. This publication will express opinion and information of personal interest as well as family photographs and family news.